With so many famous National Parks and hikes to explore in Utah some of these amazing destinations get passed by. 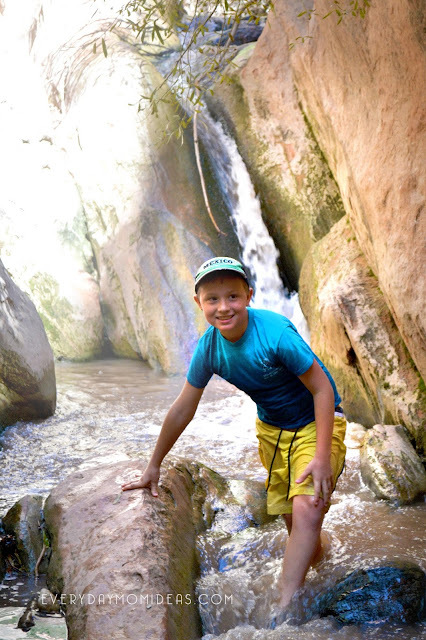 But if you're an adventurous family you don't want to miss Kanarra Falls in the southern part of Utah. 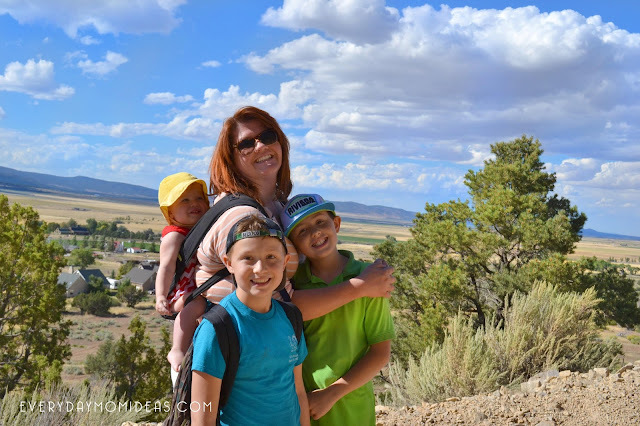 It's not just the destination that makes this hike a great family friendly hike but it's the hike itself. There are so many fun things to see, interact with and investigate along the trail that it will surely capture your kids attention and let loose their inner explorer. 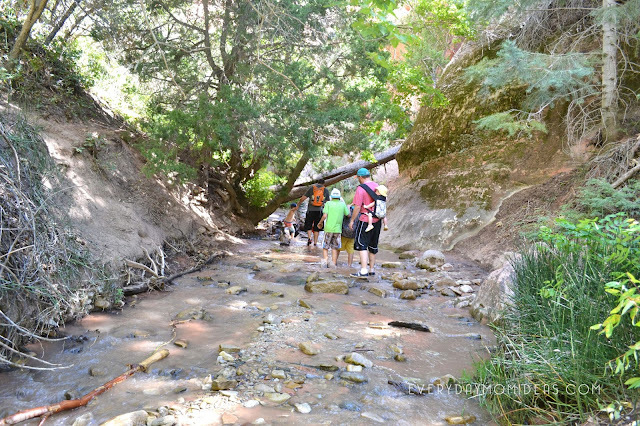 The first part of the trail is upwards and fairly unexciting but once you hit about one third of the way in you will start to follow the stream and all the fun water features. The incline wasn't was minimal after that. 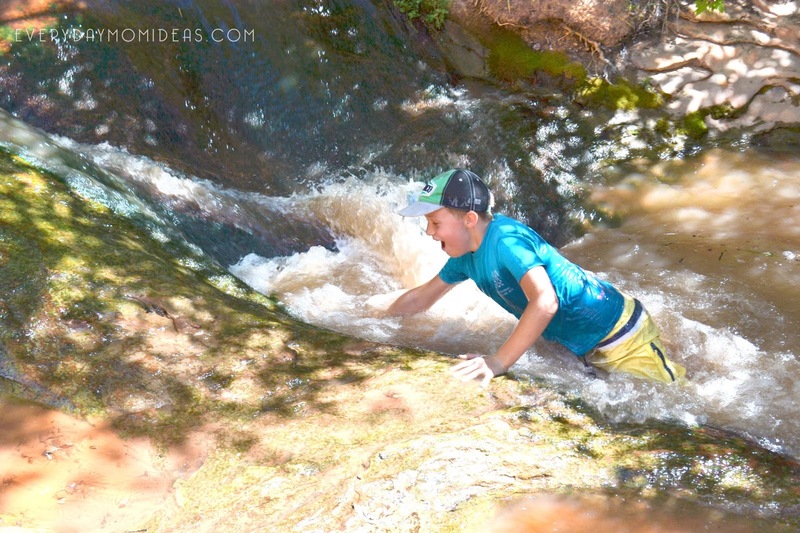 There are lots of opportunities to get to hike through the water. Which our boys liked. 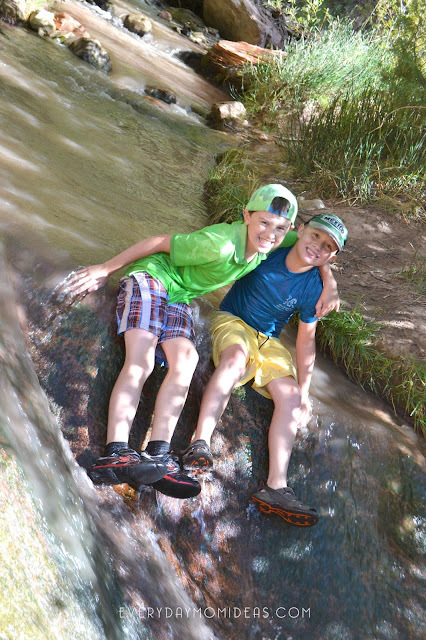 We had them wear their swim shorts and good hiking/water sandals so we didn't have to worry about them getting wet. They could get as wet as they wanted. It was kind of like a water park hike. 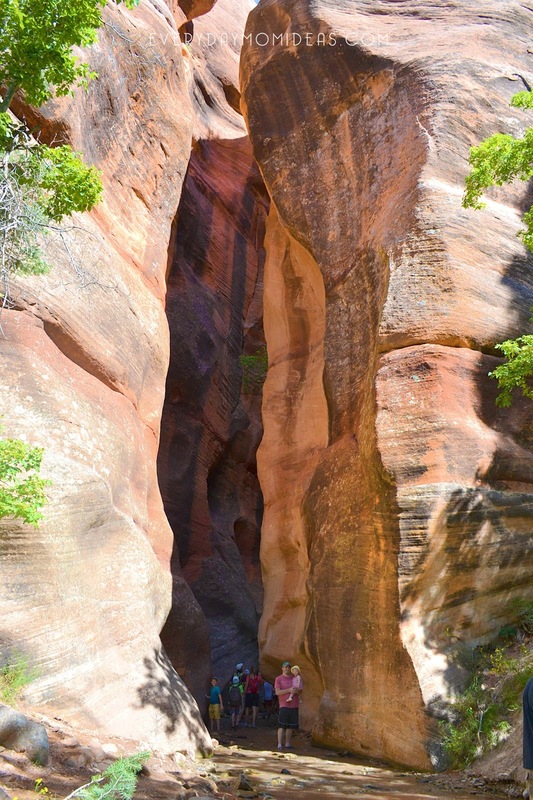 For the grand finaly of the hike you come across this impressive entrance to the slot canyon. This beautiful scene just appears as you come around one of the bends. This is my favorite photo from this trip. The cliffs are so majestic and almost overpowering. Like we were walking into the belly of the beast. Its just a little ways more where you come to the famous mini waterfalls and log stairs to climb. We decided not to go up it because it was just too dangerous to bring the baby up. But the trail ends just past that part anyways. So there wasn't much more to see. Just the accomplishment of climbing a dangerous stair like log. On the way back we let the boys slide down a bunch of these fun rock waterfalls along the way. We took our time and let them play in some of the little pools of water they had been begging us the whole way up to let them get into. This is a picture at the end of the hike overlooking the small town of Kanarraville Utah. We couldn't believe how great our one year old baby did. I think that is partly due to how much shade was available and she liked getting to look at all the water rushing and splashing by. Babies love water. I can't wait to come back again in a couple of years when she is a little older so she can get to hike it with her own two feet. Plan 3 to 4 hours to complete the hike. Lots of kids do this hike. I know of four year olds who have done it without any problem. This is a five mile round trip hike so bring a massive daypack of water and lots of high calorie snacks. There is no place along the way to get clean drinking water. Go to the Bathroom right before you go. There is little-to-none places to hide along the trail if you gotta go. 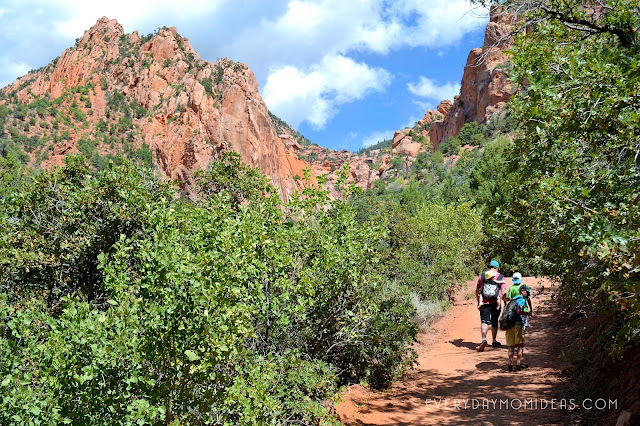 And its a busy trail with lots of families and local Utahns. 2/3 of the trail is covered in the shadows of the trees bushes and mountains but the first part is in the blazing sun. So you will need sunscreen and hats. If you plan to bring kids under three be prepared with proper carriers. 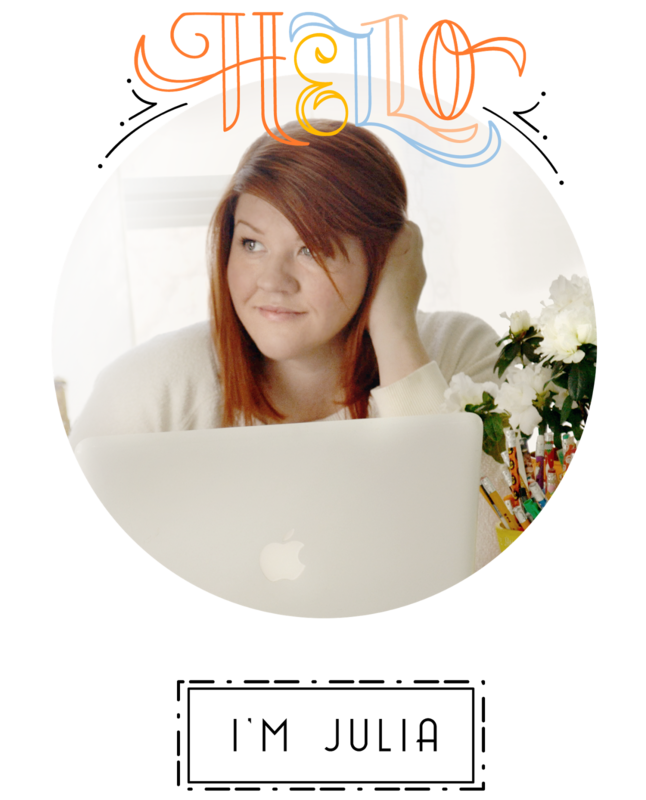 Kanarraville does not have many store so get your provisions ahead of time. If you are visiting Zions National Park, this is a great nearby hike you can hit as well. Please do your research about Kanarraville Falls and the water conditions before you head on out. This is a moderate trail and some planning ahead is recommended. Please share this Pinterest Friendly Image below with your friends and family on Pinterest or save it to use closer to your trip to Kanarraville.